Today is episode 614 of the School of podcasting and we are talking about the most important question a new podcaster should answer before they start. We also have a cool resource for royalty free music. I also share my thought in podcast sponsor markets. Tyler Primavera asked me, “I discovered your SOP and ATPC shows and I really appreciate them! I'm slowly working my way through them, sorry to hear about Bernie the cat. I really want to start a podcast in veterinary school (starting in the fall), but I'm afraid of the time commitment. I really think podcasting is a great idea (I wrote in depth about it here at my blog https://wp.me/p9MJTj-1U), but I'm afraid of the commitment. How do I decide to podcast or not? 1. Why Do You Want to Podcast? Through my podcast, I hope to speak (and live) the message that personal well-being is an absolute must during veterinary school, and that no vet student is ever truly alone. I want my podcast to improve the lives of veterinary students first, and the veterinary field second. I want to do my little part in tackling the big problem of veterinary mental maladies. 2. How Will You Know if It is Successful? While I realize this can change. By answering this question as a consultant I can steer the podcast in the right direction. I can shape the call to action, etc. I can also see if the topic is in alignment with the goal of the show (cause that is not always the case). 3. 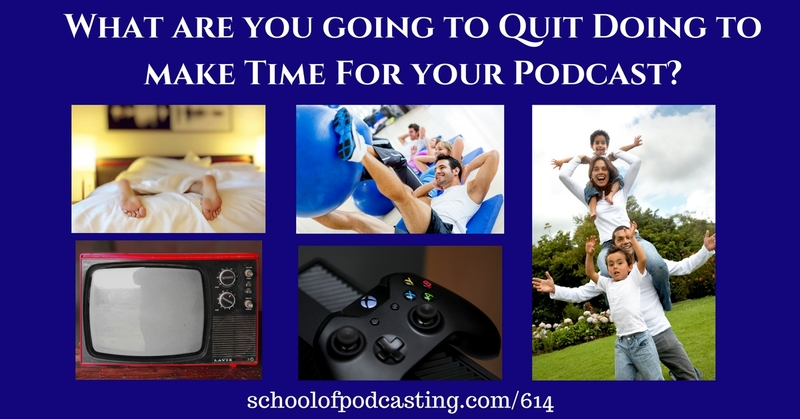 What are You Going to Quit Doing to Make Time For Your Podcast? This is my main point of this episode. Unless you have a large budget and are farming this out, your podcast s going take more time than you think. While I normally say use a four to one rule (a one hour podcast will take four hours to create start to finish), that number could easily be five to one when you're new. With this in mind, unless you have a time machine there are still only 24 hours in a day. Most of us do not start a podcast because we are sitting around watching Dr. Phil and being bored. It is typically quite the opposite. Adolph Hitller said, “At the risk of appearing to talk nonsense I tell you that the National Socialist movement will go on for 1,000 years! —Time, 1934. Hitler had had the will to extend his National Socialist movement for 1,000 years. He had the will, but there was no way. In fact, I don't think he lacked the will. If you have no margin in your life, then you are going to have to stop doing something to make time for podcasting. This is not an opinion, it is a fact that there are only 24 hours in a day. I've mentioned this before. You need your attitude, your health, and support of your family. When you stop sleeping, you health fails which may lead to a bad attitude. If you don't have the support of your family, then that also kills your attitude (and the stress can lead to health issues). If you don't have the right attitude, it may come across the microphone, and overall kill the motivation to put out great content. With this in mind, what are you going to give up to podcast? When I was in my 20's I was on a few bowling leagues. I gave up time watching TV (but I was with my family). When I was in a band, I gave up time with my family to go to practice. Being in a band also made me give up sleep as I often didn't get home until 3 am. 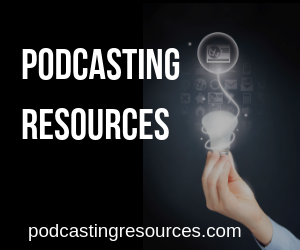 Podcasting is no different, so when you are excited to start a podcast you need to look at the amount of margin in your life and see if you have the time to create a podcast, or the budget to farm it out. Thanks to Steve Stewart for turning me on to this in his Podcast Editors Club Facebook Group who told me about MelodyLoops.com where the music is about $10 a track and you can go back into the track you purchased and have it generate a longer/shorter version of the music. Dave What Do You Think of Podmosphere? I've never heard of podmosphere, and when I look at their site it looks like the same site I've seen over and over again. Here is the concept. .0225 X 300 downloads = $6.75 per episode. So its free except for the 7.1% of the income you are taking. They are based on CPM, and the more niche your show is the more you should charge. However, so far it doesn't seem to be working. There is one BIG thing missing from these marketplaces: sponsors. Sure it sounds like a good idea, but in the end, if there are no sponsors it doesn't work. Why is there no email saying, “He this month we paid out X amount of money to podcasters? Also be sure to notice things when you go to cast.market and look at their news section and see the latest update is from April 14 of 2017. So there has been nothing newsworthy for a year? For the most part CPM pricing does not work for 92% of podcasters (unless you're happy making $27 a month and adding another hour of time for the paperwork). I have not looked into Podbean's offerings and marketplace yet. As the one thing these services are missing are advertisers, if the rules of supply and demand are in effect it may be worth looking into advertising your show on another show. It's an idea. What Should I Use -14 or 16 Lufs? Spotify and Amazon want your files to be exported at 14 lufs. Many podcasters were exporting at -16. Apparently -14 is louder. How much louder? Is it a big deal? When I took a wave file and exported the same original file in the different formats, it was about 2 db louder (here is a screenshot where you can see the -14 lufs is louder. For me, I was riding my bike this week and some podcasts I had to strain to hear over the traffic. I'm going with the louder setting.